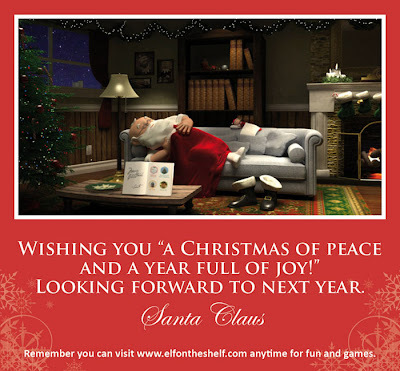 We received an e-mail from Santa through Joy (our Elf on the Shelf). It's nice to know that Joy is safely back at the North Pole with Santa until next year. It's also nice to know that at least Santa is able to kick up his feet and relax on Christmas day. I hope everyone is having a wonderful day with their families. Merry Christmas to you all!